Most people follow a routine of grooming to look their best each day. However, there are some things you need to consider before you commit an etiquette faux pas. Primp all you want, but remember that there is a time and a place for everything. If in doubt about doing something in public, don't. It's always good form to excuse yourself to primp in private. Put your makeup on before you leave the house. Doing it while driving is dangerous, and applying it on the train or bus is rude. It can also be quite messy in a moving vehicle. 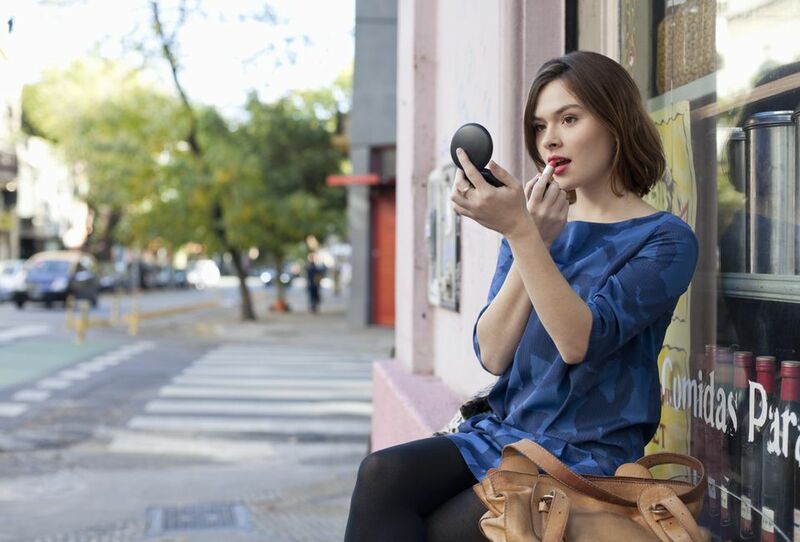 You may apply lipstick in a restaurant as long as you can do it without looking. If you need a mirror, follow proper table manners; get up and go to the ladies' room. Whatever you do, don't use your butter knife or the back of the spoon as a mirror. It may be funny, but it's also bad manners. You may powder your nose as long as you don't place your compact mirror between yourself and the other people at the table. Brushing your hair at the table is always inappropriate. This is not only rude; it is unsanitary. No one wants to eat food with flyaway hair or scalp particles that escape during someone's grooming session. Excuse yourself and go to the restroom to groom your hair. Most people will agree that freshly polished nails can be quite beautiful, but the smell of nail polish and removers can be noxious. Polish your fingernails at home or have it done at the hair salon. If your polish chips while you are out, excuse yourself and take care of it in the restroom. The same applies to nail glue. Find a private location to glue on a fake nail that has cracked or fallen off. Remember that when you file your nails, fingernail dust flies. Think about it. Do you want to have other people's fingernail dust in the air you breathe or surfaces you touch? Never bite your fingernails, either in public or private. This is one of the dirtiest, grossest things a person can do. Dirt has a way of getting up under the tip of the fingernail, and it harbors disgusting bacteria. Ick! A clean, fresh mouth is essential if you want any kind of social life, but please don't floss or pick your teeth in public. Do that in the privacy of your own bathroom. If you get something stuck in your teeth while eating out, go into the restroom and take care of it. Restaurants may offer toothpicks at the door, but that doesn't mean you have to use one in front of all the patrons. You may pop a breath mint or discreetly pump a little breath spray into your mouth. Never apply perfume in public. First of all, many people have allergies, and you could cause someone to have a respiratory problem. If you must wear fragrance, dab a small amount on your wrist and behind your ears before leaving your house. When you notice that your friend has spinach between her two front teeth or has lipstick smeared all over her face, let her know, but do it discreetly. You wouldn't want someone to embarrass you in front of a roomful of people, would you? If you see someone you don't know with a price tag sticking out of his sleeve or a dryer sheet peeking out from his collar, try to find a gentle way to let him know. You may softly tell him, or if that's not possible, gesture by pointing to your own collar or sleeve and then pointing to his. Chances are, he'll get the message. Make sure you do this with a smile so he knows you're trying to help. Why Is It so Rude to Whisper Around Others?